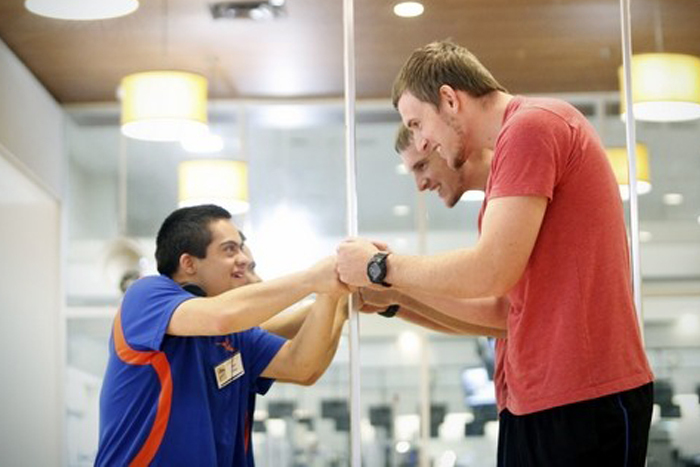 Fun Inclusive Training (FIT) for ALL is a free fitness program designed for individuals with special needs. Every aspect of the program is geared toward helping those with developmental and intellectual disabilities, such as Austism, Down’s Syndrome, and Prader-Willi Syndrome. Fitness for those with special needs. The six-week program provides 18 classes, each with one-on-one instruction and structure to guide participants through fitness activities including a circuit style group class and strength training machines. Outcomes include improved endurance, reduced body fat and secondary risk factors, and improved cognition, social engagement, and self-image. Read the Gainesville Sun article. Over 250 volunteers have served as coaches in the program which began with 15 participants and is now up to 50 special needs athletes. Participants do not have to be members of GHF.